When it comes to great Native American jewelry, Colorado residents and visitors turn to Toh-Atin Gallery first. We offer a beautiful display of turquoise jewelry, hand-crafted jewelry, and more to add to your personal collection. 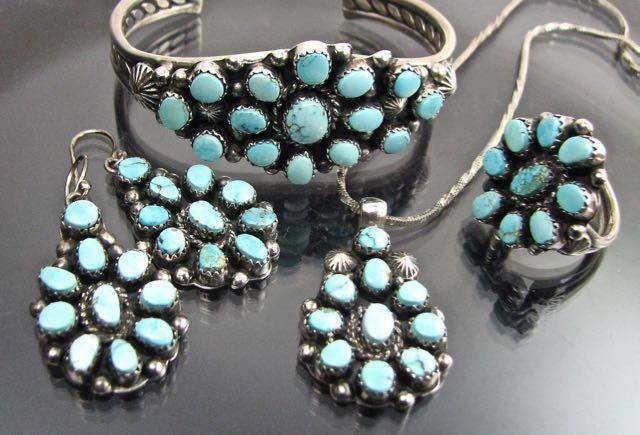 We have a large selection of authentic turquoise jewelry Colorado residents and collectors wear and enjoy. We have worked with many award-winning artists for decades and offer quality jewelry from all of the Southwestern Native tribes. We live in the state of Colorado and have customers around the world. Toh-Atin Gallery is a favorite destination for jewelry collectors from across the country. As one of the largest Native American art galleries in the nation, we have a reputation for fine quality and authentic pieces and we take pride in the works we put on display in our gallery. Native American jewelry includes turquoise, overlaid, inlaid, and traditional hammered gold and silver work, beaded crafts, and more. We are always adding new artists and works to our gallery, so you are sure to find something that you will love. We have jewelry from all of the Southwestern tribes in a variety of price ranges. Necklaces, buckles, concho belts, bolo ties, bracelets, pins, pendants, and earrings in all styles can be found in the gallery. When you are looking for beautiful Native American jewelry Colorado residents and beyond enjoy, think of Toh-Atin first. Our quality is unsurpassed, and we take pride in the pieces we sell. Stop by our gallery or browse our website today to see the fine authentic jewelry we have to offer. We are looking forward to sharing our selection with you! Assorted silver beads by Virginia Tso, JVTN-480.